France’s leader in its field, Arkema is one of the most “influent” chemical manufacturer in the world. The company Arkema has a strong industrial culture, an international presence with a great capacity for innovation. 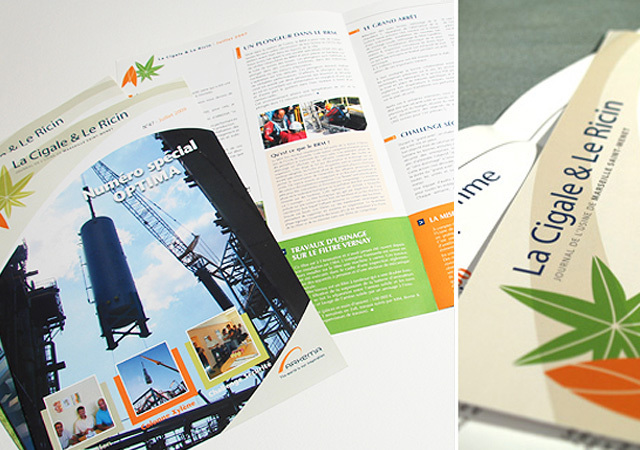 A monthly newsletter for the Arkema Marseille factory’s staff. Design, production of the template according to the company’s graphic chart: text and photos were provided by the factory’s communication department. Layout production, printout, envelope stuffing, stamping and postal mailing to all the factory’s staff. This is the set of services done by Ideogram Design for this product.